Today, walking around Grand Central I was reminded once again that the late Victorians had a different attitude towards light bulbs than we do today. To them an exposed light bulb looked stylish and modern, to us it’s a symbol of decrepitude and poorness. We hide light bulbs behind shades and diffusers. The Victorians liked to show them off. Here is a fine example – an expensive-looking gilded chandelier in Grand Central topped off with exposed light bulbs. You can also see examples of these in IRT subway stations. 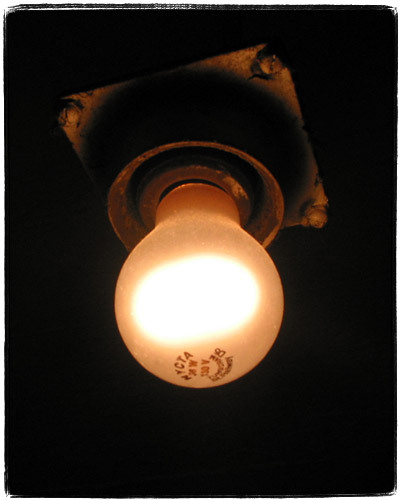 Victorian kitchens often had the simplest of light fixtures – a light bulb on a pretty woven cord, like this one sold by Rejuvenation Hardware. The also sell an amazingly cool looking replica Edison light bulb to go with it. My own kitchen is Art Deco-styled, but I was very tempted to get one of these. Victorians also had a different attitude towards kitchens, and I absolutely agree with them. Every time that I hear on “This Old House” how kitchen is the most important room, kitchen is the center of the house, how the owners plan to entertain in the kitchen – I shudder. How can a nation so overweight make an altar out of the room where it is destroying itself? I am an overweight glutton myself (especially when depressed), but I certainly would not want to build my house around a kitchen. The Victorians had the right notion – a kitchen is a utility room. Like the laundry. Or the butler’s room. Or the carriage house. Also, while we are on the subject of unusual light bulb – there’s a company that sells odor removing light bulbs. They claim that the Titanium Dioxide coating illuminated by fluorescent light is somehow breaking down odors. I hear that it works, so I ordered a couple for the room where the catbox is located. I’ll let you know how it’ll work. I’ve read somewhere that threads in all emergency light bulbs in subways are inverted. That way they would not fit into a normal socket, and make it harder for would be thieves to steal them. Regular bulbs, like the one on the picture supposedly have normal thread because they are always on and thus hard to steal because of their temperature. This bulb is not store bought – note the NYCTA logo on the bulb. I didn’t know the difference between NYCTA and MTA. Pretty interesting. If you pay attention to NYC infrastructure like I do, you might have noticed little lights that sit on street lamp poles on certain intersections. For a long time I tried to guess their purpose. I thought that they had somemething to do with street lamps. Maybe indicating when light bulbs need changing. But they do not appear on all street lamps. And sometimes they would be attached to a telephone or a power pole. Sometimes they would be lit up, and sometimes not. They do not appear on all intersections. A mystery, right? I’ve searched the net finding nothing. Finally I found a reasonable explanation in Time Out New York magazine. 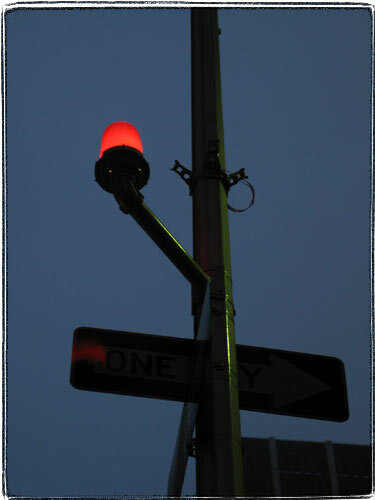 The little lights simply appear on the intersections where a fire alarm telegraph box used to be located. I knew about fire alarm telegraph boxes from an awesome book Underneath New York. You see, those fire and police alarm pull boxes that were retired a few years back in fact were automatic telegraph boxes. They all shared the same circuit which would be normally closed. When somebody pulled the handle, a clockwork mechanism would rotate a little wheel with a pattern of bumps. The bumps would break the circuit and transmit an id of the pull box in Morse code to a nearby fire station. I guess they did not handle collisions — if two boxes were activated at the same type there would be trouble. I wonder how much electricity is wasted on those things. Interesting, ADT stands for American District Telegraph. I didn’t know. Some pretty cool pictures of fire telegraph control rooms. You know what I hate? Well, many things. But I especially hate bad lighting. Office lighting. Even in the best furnished, expensive offices with Aeron chairs in cubes and espresso machine in the kitchen, lighting is provided by the same crappy cheap fluorescent fixtures of horror. You know them. There is probably one hanging above your cube right now. Grating on your eyes, throwing glare onto your monitor. Giving you headaches and depressing the hell out of you. Well, of course, it’s not like that everywhere. For instance, a long time ago, in a galaxy called the dot com, I interviewed at a company called Betelgeuse. It was named after an extremely bright red supergiant in the Orion Nebula, which name English speakers pronounce “beatlejuuuze” OR “beatlejuice”, and Russians pronounce “betelgeyze”. Itâ€™s a dying star, about to explode (or go supernova if you want to put a positive spin on it). In any case, this company had the coolest lighting scheme. They turned off all the lights except a few small spotlights, and lit the corridors with decorative candles. The offices were lit with individual lamps. But what can a cube monkey like me (and probably you) do about the lighting situation? Well, for one, you can kill the horrible hell beacon above your cube. Since there is no light switch, here is what you need to do. Get onto a chair and get close to the lighting fixture. Your task is to unplug the fluorescent tube from it’s socket. It can be usually accomplished by rocking the tube slightly left-right and away from the socket. Make sure to let your friendly maintenance person and your boss know you are doing this. You don’t want someone trying to open the fixture and get hit on a head with a fluorescent tube. Also, don’t burn or electrocute yourself. This trick only works with fluorescent tubes. But Michael, you ask, what else can I do? You can light everything with full spectrum natural lights. 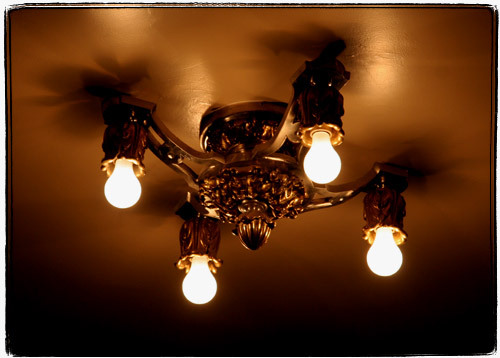 A cheapo solution is to use GE reveal bulbs. They cost about as much as regular incandescent bulbs but have a spectrum that is less yellow. Everything looks a bit better. I use Reveal bulbs at home. There is also a more expensive option – full spectrum fluorescent fixtures. Remember, in previous WML I mentioned aquarium limps? Well, besides aquarium lights they make full spectrum tubes for regular lighting. Reading a book about NYC subway. Interesting fact: old subway cars used regular light bulbs for normal lighting and special left-handed screw threaded bulbs in emergency lighting. The regular bulbs were always on, and because of that nobody could steal them easily (they were too hot). The emergency lights were threaded incorrectly, so the potential thieves would have to figure out how to unscrew them first, and even if they succeeded, they would not be able to use the bulb at home. This is kind of like special coat hangers and non-standard linens in hotels. Hmm, I can’t remember any other uses of non-standard equipment for theft prevention.